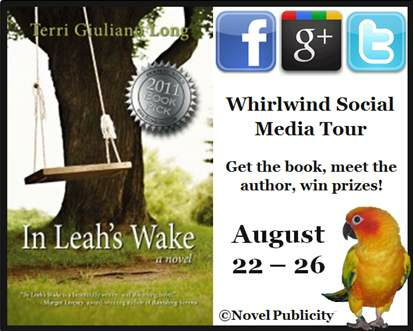 Let’s rocket In Leah’s Wake up the Kindle charts with a whirlwind social media tour! What’s more, by purchasing this novel at the incredibly low price, you can enter to win many awesome prizes, including a Kindle, 5 autographed copies of the book, and multiple Amazon gift cards (1 for $100, 3 for $25, 5 for $10, and 10 for $5 – 19 in all)! Be sure to enter before the end of the day on Friday, August 26th, so you don’t miss out. While you’re here, don’t forget to vote for your favorite blogger. Over 50 have sighed up and are competing for a cash prize of $100. The blog host that gets the most votes in this traffic-breaker polls wins, so please cast yours right after purchasing In Leah’s Wake and entering the contests! Tuesday, Twitter chat with the author! Tweet with us between 4 and 5 PM Eastern Time, using the hashtag #emlyn. We’ll be talking with the author about her favorite books and best writing advice. Bring your questions about In Leah’s WakeÂ and don’t forget to use #emlyn or to follow Terri @tglong. By joining in the tweet chat at the designated time, you may win an autographed copy of In Leah’s Wake. Don’t forget to visit the author’s blog to enter for the other prizes! Thursday, Facebook interview with the author! Stop by Novel Publicity’s Facebook page and ask Terri questions. She’s chosen three of her favorite topics to talk about: writing, parenting, and gourmet cooking. Of course, you’re welcome to ask about In Leah’s Wake too. Leave a comment or question as part of the thread, and you may win an autographed copy of In Leah’s Wake. Don’t forget to like Terri’s Facebook page or to visit her blog to enter for the other prizes! The Tyler family had the perfect life – until sixteen-year-old Leah decided she didn’t want to be perfect anymore. Will this family survive? What happens when love just isn’t enough? Which In Leah’s Wake character are you? Take the Facebook quiz to find out and learn a little bit about yourself. Then come back to this site to learn more about the role that character plays in the novel. Join the conversation by telling us which character you are and why. How do your decisions impact your life? If you were a character in this novel, would your fate be the same as rebellious teen Leah or trampled peacemaker and concerned mother Zoe? Now you can find out by choosing your own path in the In Leah’s Wake crossroads story game. First choose who you’d like to be. You can take the official character quiz on Facebook to see who you’re most like. Contemplate the deeper meaning of the novel by examining these discussion questions from the official book club guide. Leave your thoughts on the questions as a comment to this page and receive a response from the author. Start a dialogue today! Download the printable book club guide with these questions, an interview with the author, and review of the book here. In Leah’s Wake is told from the perspective of five characters: Zoe, Will, Leah, Justine, and Jerry. With whom did you identify the most? Which character did you have the most difficulty understanding? How do the multiple viewpoints weave together to form a cohesive story? Leah often changes her mind. One moment she misses her family, the next she hates them. She alternately wants to marry Todd and to break up with him. Why is Leah so fickle? Is this common of teenagers, or something unique to (or excessive in) Leah? Did you ever find yourself wanting to yell at her through the pages-to warn her that she was making the wrong decision? If Leah had remained on the soccer team could the events of the story been prevented? What about if she had remained friends with Cissy? Are there any other what-ifs that stand out to you? How does Leah’ s cutting her hair serve as a turning-point for her character? Which other changes to Leah’s appearance, thought process, and behavior redirect the story? The first time Leah runs away Zoe insists upon giving her space. Was this the right decision? Would you have reacted the same way had it been your child? In the end, Justine presents some worrying behavior. What causes her to unravel? Is it her desire for Leah to think she is cool? The impact of her sister’s abandonment? Having to act as the caregiver while both of her parents struggled with their own issues? Will Justine revert back to her old self, or is she destined to follow in Leah’s Wake? Zoe and Will have very different ideas of what it means to be a good parent. Zoe wants to keep the peace, she wants to be liked. Will desires to keep his children safe, and to do this, he often responds in anger. Which parenting style did you identify with most? Would they have been more effective had they presented a united front? How does Leah drive a wedge between her parents? Will’s job situation becomes uncertain during the course of the novel. How does this difficulty play into the plot? How does it affect his character? Would he have been more level-headed in dealing with Leah and Todd had he not been under this added stress? In the beginning of the novel, Zoe is a strong and capable woman. She leads self-improvement seminars and works as a therapist. As the story progresses, she slowly unravels finally developing an addition to Oxycotin. What drove her to this point? Do you believe she will be able to recover the life she lived before Leah’s rebellion? What role does Jerry play in the story? How does he help bring the family back together? Does he truly love Zoe, or is he just overwhelmed by being a new father? Does Zoe love him back? Is she truthful with Will about not having an affair? Todd, Hope, and Lupo undeniably are negative influences on Leah, but at times the author discusses each of these characters with compassion and understanding. Were these three really ‘bad’ people, or did they just come from bad circumstances? Did you find yourself going back and forth between distaste and affinity for these characters? Discuss the significance of the bracelet Zoe buys for Leah, Stormy. Does the birthstone ring she presents to Leah at Christmas hold an added significance; what is it? Are there any other important symbols in the story? What about the rope swing? Justine’s science project? The strangled hamster? Zoe’s flashbacks of a young Leah? Music plays a huge role in the story. From Zoe and Will’s affinity for older tunes (such as those by the Beatles, Tom Petty, and Van Morrison) to Leah’s obsession with Ani diFranco, and Justine’s attempts to understand rap. How did these musical allusions add to the plot and help us to better understand the characters? Thematically, what struck you most about this novel? Did it lead you to contemplate any deeper questions about family, responsibility, and life? How much control should parents exert over a child’s life? Do Zoe and Will push Leah too hard? Is it necessary for parents to push their children in order for them to succeed? How do Zoe and Will’s actions protect and in what ways do they fail their children? Does their intervention help or does it backfire? How might Zoe and Will have better handled Leah’s rebellion? How do micro-managed children fare later in life? What might cause a seemingly “perfect” child to rebel? Is Leah’s anxiety caused by her parents’ expectations or is it genetic, part of her personality? Is there such a thing as a perfect child? If so, how would you define the perfect child? Do zero-tolerance policies work? Why or Why not? Are they necessary? Should schools ban adolescents from activities that could keep them out of trouble? Did Coach Thomas respond properly to Leah’s outburst? Should Will and Zoe have exercised greater tolerance? Or were they too lax? How do parents prevent children from falling under the influence of the wrong people? How might Zoe and Will have prevented Leah’s relationship with Todd from getting serious? Should they have banned Todd from their home? Why or why not? Are a child’s personality and conduct influenced primarily by nature? Nurture? Both? How are Justine and Leah’s personalities a result of their parents’ influence? Might parts of Justine and Leah’s personalities be inherent? If so, which? Hillary Clinton said it takes a community to raise a child. What role does a community play in the lives of its children? Is the community responsible for the actions of an ostracized child? Why or why not? How do gossip and judgment affect adolescents? Are the effects always negative? The give-away period has ended and the winners have been contacted. We hope that you enjoyed this social media whirlwind tour!